The Prairie Falcon (Falco mexicanus) is a medium-sized falcon of western North America. It is about the size of a Peregrine Falcon or a crow, with an average length of 16 in, wingspan of 40 in, and weight of 1.6 lb. Like other falcons, females are noticeably bigger than males. The Prairie Falcon breeds from southern Manitoba, Saskatchewan, Alberta and south-central British Columbia south through the western United States to the Mexican states of Baja California, Durango, and northern San Luis Potosí. It is much less migratory than the other North American falcons, but in winter it does withdraw somewhat from the northernmost and highest-elevation parts of its breeding range and spreads west to the deserts and Pacific coast of California, and south to Baja California Sur, Jalisco, and Hidalgo. 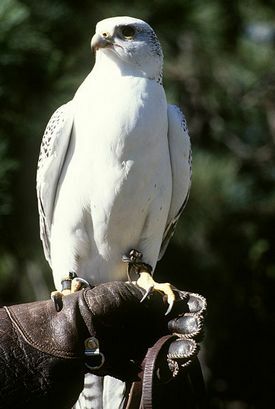 Prairie Falcons are often used in falconry. Although it is considered hard to train and unpredictable, it’s the most popular falcon in the United States. They are also valued for their aggressiveness. Their population is estimated to be stable or increasing at over 5000 pairs.